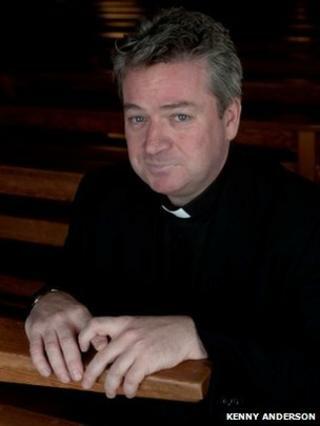 A priest who wrote a book alleging the Catholic Church in Scotland suffered from a "culture of homosexual bullying" has been suspended from his post. Father Matthew Despard was removed from St John Ogilvie Church in Blantyre, part of the Diocese of Motherwell, by Bishop Joseph Toal on Saturday. A case has been brought against him for breaking church or canon law. Some parishioners voiced opposition to Father Despard's removal and walked out during a service on Sunday. In his book "Priesthood In Crisis", Father Despard claimed that sexual misconduct was rife among the clergy and the church authorities did not take action when he alerted them to allegations. Bishop Toal, who was appointed Bishop of Argyll and the Isles in 2008, took over administration of the Diocese of Motherwell in Lanarkshire, following the retirement of Bishop Joseph Devine earlier this year. A spokesman for Bishop Toal confirmed that Father Despard had been removed. "Since there is a canonical case in progress at the present time, Bishop Toal felt it was appropriate to remove Father Matthew Despard from parish ministry, until the judicial process has run its course," he said. "This action does not prejudge the case in any way. "Father William Nolan, of Our Lady of Lourdes Parish in East Kilbride, has been appointed parish administrator in the interim."